In launching the Festival in 1961, Prince Rainier III of Monaco, "wished to encourage a new form of artistic expression, in the service of peace and understanding for mankind". 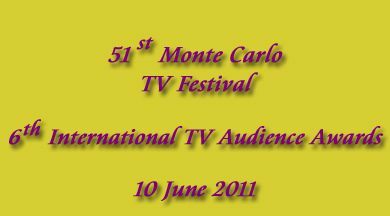 Monaco's international status ideally suited the Prince's ambition: to recognize television as an exceptional means of bringing cultures together and enhancing their respective knowledge. This project immediately generated worldwide interest and over the years, many distinguished celebrities have sat on the successive juries, bringing international recognition to the best of television programming. In 1988, H.S.H. Crown Prince Albert II was named President of the Festival. 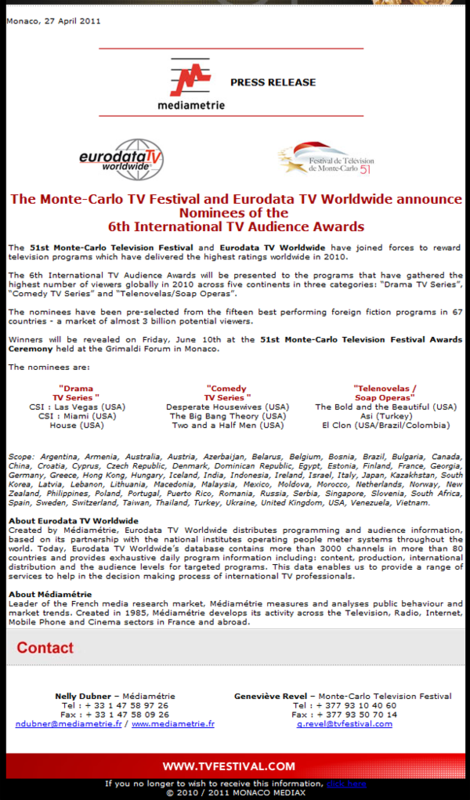 The 51st Monte-Carlo Television Festival and Eurodata TV Worldwide have joined forces to reward television programs which have delivered the highest ratings worldwide in 2010. 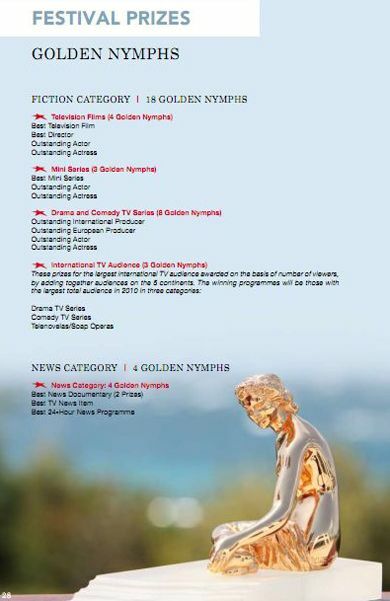 The 6th International TV Audience Awards will be presented to the programs that have gathered the highest number of viewers globally in 2010 across five continents in three categories: “Drama TV Series”, “Comedy TV Series” and “Telenovelas/Soap Operas”. 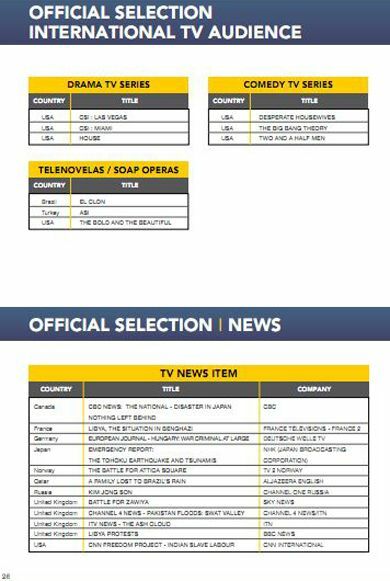 The nominees have been pre-selected from the fifteen best performing foreign fiction programs in 67 countries - a market of almost 3 billion potential viewers. 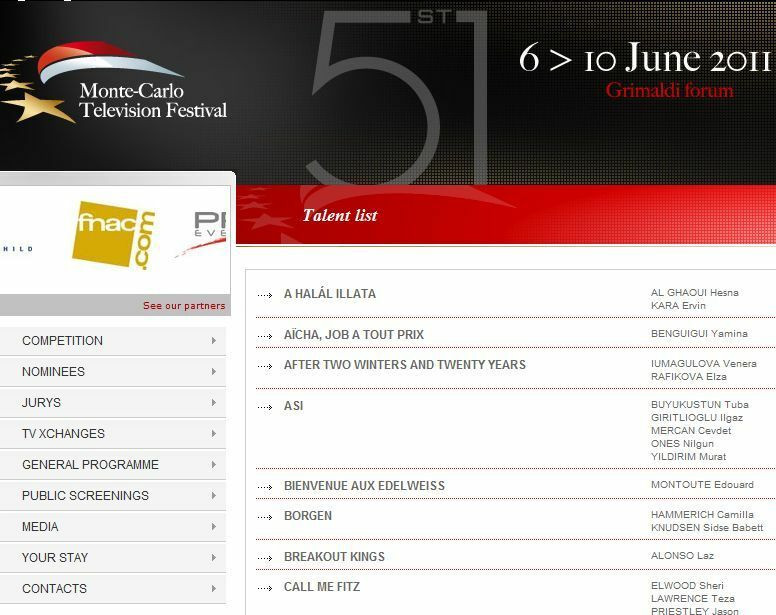 Winners will be revealed on Friday, June 10th at the 51st Monte-Carlo Television Festival Awards Ceremony held at the Grimaldi Forum in Monaco. Scope: Argentina, Armenia, Australia, Austria, Azerbaijan, Belarus, Belgium, Bosnia, Brazil, Bulgaria, Canada, China, Croatia, Cyprus, Czech Republic, Denmark, Dominican Republic, Egypt, Estonia, Finland, France, Georgia, Germany, Greece, Hong Kong, Hungary, Iceland, India, Indonesia, Ireland, Israel, Italy, Japan, Kazakhstan, South Korea, Latvia, Lebanon, Lithuania, Macedonia, Malaysia, Mexico, Moldova, Morocco, Netherlands, Norway, New Zealand, Philippines, Poland, Portugal, Puerto Rico, Romania, Russia, Serbia, Singapore, Slovenia, South Africa, Spain, Sweden, Switzerland, Taiwan, Thailand, Turkey, Ukraine, United Kingdom, USA, Venezuela, Vietnam. Created by Médiamétrie, Eurodata TV Worldwide distributes programming and audience information, based on its partnership with the national institutes operating people meter systems throughout the world. Today, Eurodata TV Worldwide’s database contains more than 3000 channels in more than 80 countries and provides exhaustive daily program information including: content, production, international distribution and the audience levels for targeted programs. This data enables us to provide a range of services to help in the decision making process of international TV professionals. Leader of the French media research market, Médiamétrie measures and analyses public behaviour and market trends. Created in 1985, Médiamétrie develops its activity across the Television, Radio, Internet, Mobile Phone and Cinema sectors in France and abroad.